Jane Ellison, the UK’s Parliamentary Under Secretary of State for Public Health at the Department of Health wanted to recognise the unsung local heroes of public health and to honour those people who have selflessly committed themselves to improving the health and wellbeing of their communities. 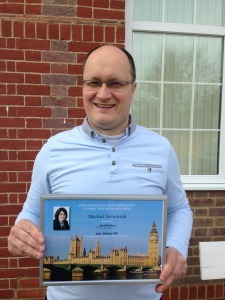 In mid-February, Michal Siewniak, Community Development Officer in the Community Voluntary Services for Broxbourne and East Herts (CVSBEH) in UK, received a letter from the Department of Health inviting him at the House of Commons Terrance on 3 March 2015 where he would be presented one of these recognition awards. On receiving the letter, Siewniak suspected it could be in honour of the MOVE Week events he has coordinated in his community. After consulting the Director of Public Health at the Hertfordshire County Council, Jim McManus, he decided this was most likely the case. MOVE Week 2012 engaged 60 people in Hertfordshire. The following year, Siewniak’s team of volunteers managed to attract over 450 participants to their events. MOVE Week 2014 was even bigger, delivering 19 activities across the country and offering residents the opportunity to experience 12 different sport disciplines. “I am deliMichal Sghted that this project has been chosen out of so many successful initiatives and I am sure it will give us an extra boost to take this fantastic campaign to the next level,” Siewniak says. “It provided a fantastic platform to engage people and communities of all ages and abilities. Activities such as a badminton tournament, basketball taster sessions and health walks provided a chance for children to play and compete together with their grandparents, demonstrating how sport can help bridge the generation gap. MOVE Week helps to break down barriers, tackles social inclusion and improves community relations. It has also helped to raise the profile of other local sport and fitness clubs that get involved, encouraged by a new local grant scheme. MOVE Week shows the positive impact of sport and physical participation in our community”. “I hope it will help us to build new networks, encourage wider participation and engage with wide range of groups and communities,” he says.